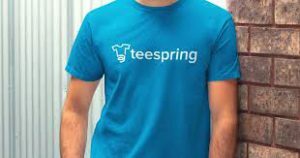 Home › Reviews › What Is Teespring About? What is Teespring about? Continue to read my review of Teespring to further enlighten yourself about this potential money generating website. Teespring is one of the handfuls of companies that offers an easy to use platform for designing and selling products online. 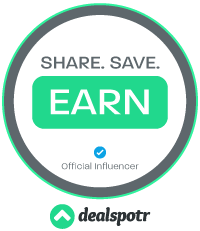 It’s a print on demand and crowdfunding company all rolled into one.They were founded in 2011 so at the time of writing this been in business for over five years, long enough to be an established company. The great thing about Teespring and these sort of companies are, there is no upfront cost or risk to you the designer if you choose to try your hand at this. Kinda of comforting. Screenshot of creating a t-shirt. What products can you design and sell at Teespring? It’s more than just a regular t-shirt, as shown below. 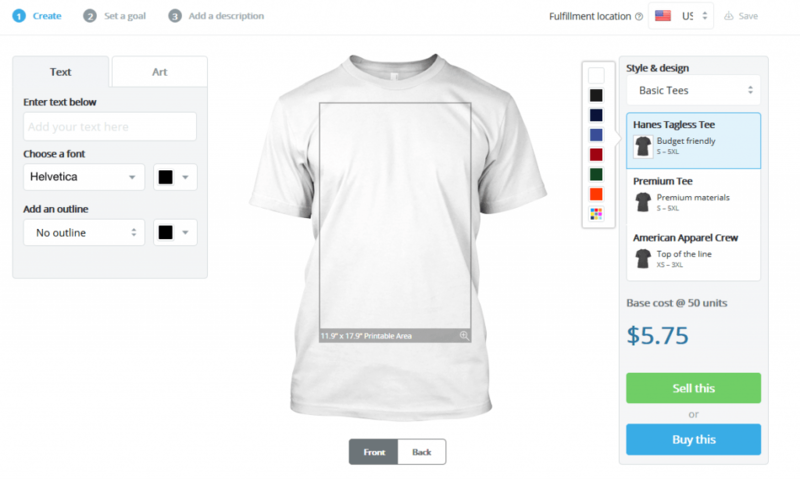 How Teespring works simplified, just design a shirt or product, set a price, add a goal and start selling. A key point here, you must collect enough pre-orders (goals, which you set) or your shirts will not sell and ship. You set the minimum pre-orders or goals if you don’t hit this number your shirts don’t print or ship. But the good news if you do collect enough pre-orders, Teespring will print and ship directly to buyers. Then you get to keep the profit. All the information about the cost of production, the amount of profit per shirt is all shown within the system. They are worth reading and comparing before embarking on the t-shirt designing business. A lot of people use all of these T-shirts platforms to try and maximize their exposure and profits. Goals, are set by you. They can be set as low as five shirts or as high as 1000 shirts. The more shirts you sell, the more profit you make per shirt. Also, the more you add to the shirt, like art, for example, the less profit per shirt there is. The great thing it is all shown to you in real time when you are designing your product. I really like this feature building a product with no hidden costs popping up out of nowhere. The platform is completely free to use. I have heard of some sellers having as many as 200 campaigns at a time. So don’t be afraid to go all in with as many campaigns as you want. Teespring solely only takes the cost of production when you successfully sell a product. This is all shown upfront, so no surprises. So you the designer must come up with the ideas and designs of products. But you’re not done there yet, and you must also assemble an audience in which to sell to. Many people advertise on Facebook through their Facebook Ad campaign. This is where you spend money on, advertising. At Teespring University, they deal with this whole aspect, and you must read up on this to learn this valuable information. Teespring has two methods of payments. PayPal (which I prefer) and a check through the mail. A completely free platform, so design and have as many campaigns as you want. Teespring has a very useful teaching platform called University, that is a must to go through. Especially if you’re new to the world of designing T-shirts. It covers all the necessary you will need in order to be profitable. For each different item to sell, you have a choice of choosing different brands from which to have your design printed on. For example, basic tees have three choices: Hanes Tagless Tee, Premium Tee, and American Apparel Crew. Options are always nice. How much money per shirt is shown when designing so no more wondering. Manufacturing and shipping is Teesprings responsibility. If you are an artist, Teespring allows you to upload your own art. Other products along with shirts can be sold, totes, mugs, etc. A great way to fundraise money. A great selection of sizes from small up to 5XL. Every manufacturer has a different size range, so be sure to verify which one is right for you. A large selection of stock photos to possibly use for designing a product. Some 50 fonts to choose from. Ability to sell international, just be sure to select EU for the fulfillment location. Payments are made either through PayPal or check. Currently, Teespring has no affiliate program. Lots of negative reviews on SiteJabber ranging from small shirt sizes to cheap materials. With a dismal 14% of 4.5 to 5 rating. Possibilities of losing money, mostly through advertising when you don’t hit your minimum of enough sales to reach your goal. Can be a very highly competitive field to get into. You are limited to the time your shirts are available for sale. So There is a time limit. If you have a design that sells well, expect copycats to latch on to your design. Read my post on tips for designers here, Tips For Designing T-Shirts And Selling Them Online. 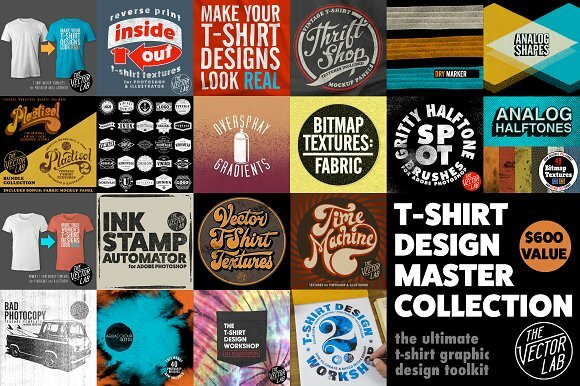 Looking for cheap bundles of fonts, graphics or brushes and more, Creative Market is a must visit. I just love this site. Model, but don’t copy a successful design. Take a successful design and make it your own. Try to make it better, not as easy as it sounds. Some people thrive on coping winning designs and emulating them. You can also do this, but you are following not leading. Don’t use copyrighted materials in your designs, either slogans, artwork, or logos. The people that who Teespring is for is vast, which show what a good business model it is. Entrepreneurs – Individuals that are looking to make money. Charities – American Red Cross, The Salvation Army, Save The Children. Fundraisers – Church, Wounded Veterans, Cancer Research, etc. Businesses Or Teams – Promote their group. The Teespring University is a resource you must become familiar with before you begin selling products. It will successfully get you addressing and setting you off on the right foot to launch your campaigns to profitability. From refining your audience down to niche. Then finding where your niche is most likely to be found online. This system is a step-by-step system that basically leads you down success alley. Or at least a good strategy for selling. But wait…it doesn’t stop there it goes into all aspect of the t-shirt business, designing and all the other resources. This should be required viewing. Along with the University, Teespring also has a helpful Teespring Blog. The Blog covers everything from e-commerce, digital marketing and the general information of running an online business. Teespring has a full line of staffed people manning the Teespring Chat, ready to disperse near-instant information and help. What is Teespring about? 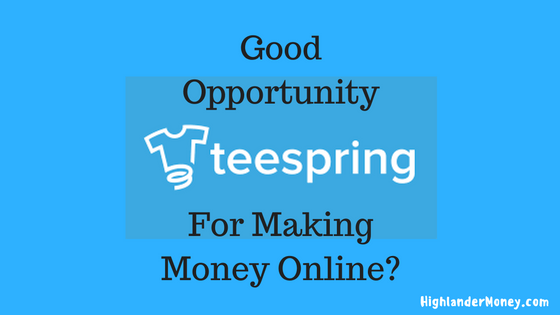 In conclusion, if you are looking way to earn money online and the idea of creating and designing shirts is appealing to you, I would highly recommend Teespring to help launch your business venture. It’s been around for awhile now, and with a stable platform, it’s hard not to consider using Teespring. It’s also free to use, which is fantastic. With hard work and great designs and more importantly successful advertising, one could do well for oneself here at Teespring.